Will the Currency Zombie Eat the Trans-Pacific Partnership? Currency manipulation is the issue that never dies. No matter how many times the link between exchange rates and American jobs is shown to be tenuous, the matter rises again like a zombie. 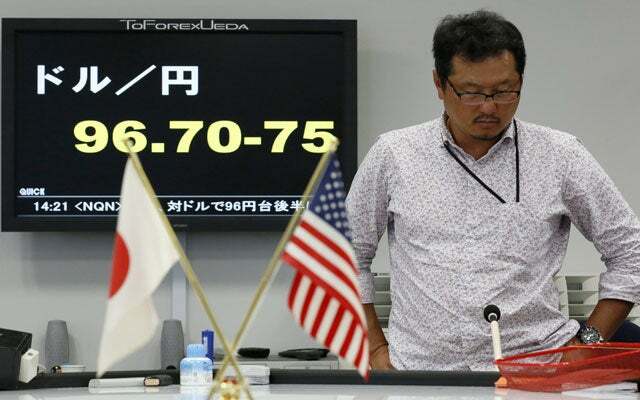 In this case, it is Japan that has brought exchange rates back into the spotlight, as the yen has weakened sharply in the past six months. A majority of the House of Representatives wrote a letter to the President last week asking that exchange rates be included in the Trans-Pacific Partnership (TPP). The Members are right to hope that the TPP is comprehensive, but they would be wrong to hope that “currency manipulation” should become a part of the agreement. Some Members of Congress believe that Japan is manipulating its currency and should be made to stop if it wants to join the TPP. And it is true that Japan has driven down the value of its currency by selling gigantic amounts of government debt and, more recently, sharply increasing the total money supply. But this should sound very familiar. Putting aside the fact that some people think a $750 billion fiscal deficit this year constitutes “austerity,” the U.S. has been pumping out federal debt and new credit as fast as we can for closing on five years. If Japan must stop manipulating its currency in order to join the TPP, we must also. Restarting the process of global economic liberalization that will permit American companies and workers to compete freely. The two goals involve, among other things, greatly improving the protection of intellectual property rights, sharply limiting the advantages granted to state-owned enterprises, enhancing market access in services, and unifying a very messy set of rules of origin. Each of these tasks by itself is both daunting and far more important to American prosperity than exchange rates. And that’s putting aside the problems with us complaining about other countries’ fiscal and monetary policy. Shouts about currency manipulation are unavoidable. We shouldn’t let them distract us from the true—and truly difficult—job of securing a TPP that is strong on the issues that count.